Visit Apple Store, online at Store.Apple.com/US, to find the world-famous products that make your life more comfortable, everyday. 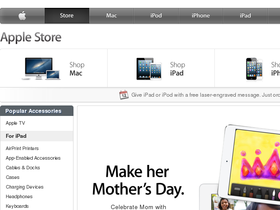 Discover the latest technological innovations at Apple Store in the form of the iPod, iPad, iPhone, and the Mac. There is a good reason why Apple products are in every home -- the design and technology are unparalleled. Experience the newest Apple Store release or find accessories for the devices you already have. Either way, check RetailSteal.com for Apple Store discounts, Apple Store promotions, and Store.Apple.com/US coupon codes. Get free standard shipping on orders over $50 at Apple Store. See website for full details; exclusions may apply. Enjoy a $100 credit from the App Store when you purchase a Mac for college at the Apple Store today. Buy your new iPad for college at Apple Store online today and enjoy a $50 credit from the Apple App Store. At the Apple Store find select iphone 4s for $0. Click to start saving. Shop the refurbished macs at Apple Store to save big. Click to save. If you are a student or educator shop at the Apple Store and save up to $200 on a Macbook. Spend $50 or more on your entire order from Apple Store and automatically receive free shipping. Click to save. Use this promo code at dell.com and save an additional $50 off select PCs that are $699.99 or more. Purchase limit of 3 items per order. Shope at Dell.com and save $25 on select home and home office electronics and accessories when you bundle products totaling over $150. Offer ends soon so click here to save today! Shop at Dell.com and save $75 on home and office laptops and desktops when you spend $999.99 or more. Excludes Alienware.